Welcome to the second installment in my Tipping Point series, which looks to explore important cards that are teetering on the verge of major price spikes due to low supply. My focus here is to try and flag cards in time for you to grab what you need for decks or get in early enough to profit. In comparison to picks made earlier in the reprint cycle, the cards found in this series are going to a) offer less meat on the bone but b) be more likely to succeed (due to their already low supply/reprint risk). You will also notice that many of these picks will tend to be foils and promos rather than non-foils as for obvious reasons foils tend to dry up much faster than non-foils, except for the most important of staples, where regular copies may quickly follow during a spike in demand. In terms of timeline, I’ll be aiming to get you in and out of positions within a year, or setting you up to save good money on cards you might have been holding back on unnecessarily. This week we’re looking at the Amonkhet Invocations. Perhaps the most maligned of the Masterpiece Series cards released so far, the Invocations put off many players due to their busy borders and near illegibility as game pieces. Without further ado here are my picks for cards at the tipping point heading into early spring. 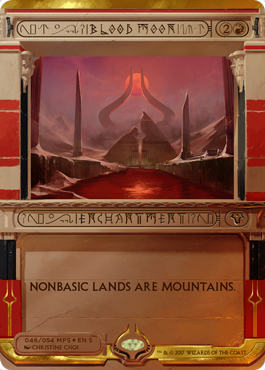 Indisputably the most important Modern card in the Invocation list, Blood Moon also sees play in both Legacy and EDH as well. This should mark this version as the most durably popular of the Invocations, but there are a few cautionary notes. Firstly, the card was a lot more exciting near it’s lows around $90. The other factor is that this card has a small pile of competing versions, including foils from 8th, 9th, Modern Masters, Modern Masters 2017 and M25. That really is a lot of competition, but the reality is that the inventory has been draining hard on this version. Given that word on the street is that Hour of Devestation is already out of print on low demand, Invocations from that set are likely to be very tough to restock moving forward and this could be contributing to the low stock. Surprisingly, the other Invocation representing very low supply is black enchantment No Mercy, a powerful EDH card that has only ever been printed in foil (or otherwise) one other time, way back in Urza’s Legacy. EDHRec has the card reported in 4000+ decks, which suggests moderate demand, but it’s possible the card is underplayed by black mages overall. In contrast to Blood Moon, this is a cheap card that has only seen two foils in twenty years so it should be a strong option for acquisition given the solid price floor, broad utility in EDH and good possible upside. Maelstrom Pulse is another card with multiple competing foil printings (Alara Reborn, Modern Masters & GP Promo) but with Jund back on the menu in Modern this season, all of them are on the rise. This version can currently be found between $55 and $60 and I can see it easily cresting $80 before the end of the year given how small the supply already is. As with Blood Moon there is some moderate EDH demand to backstop this play. This card may not be on your radar but that’s probably because it’s only EVER seen one other printing, with the original fifteen years ago in Planeshift. OG foils already go for $65+ and the odds of WoTC reprinting this again anytime soon are low given their general lack of interest in efficient tutors. Supply on the Invocations is already low, the black cards are the best looking of the set, and EDHREC.com reports 7000 decks running the card already, which as with No Mercy, is probably too low. I see no reason to hold off on picking a few of these up to add to decks and wait for the near inevitable payoff. We’re late on this one. Of course Hazoret was a major part of Standard this year, but it’s not Standard players that recently cleaned this version of the card out closer to $60. Those purchases were almost certainly made on the assumption that this will be an occasional player in Jund builds for Modern for some time to come. I’d pass on the card at the current North American prices, but you can still source it closer to $80 in Europe, so I’ve picked up a few on the assumption that the Invocation can hold $100+ moving forward. There is some possibility that copies will enter the market when Hazoret rotates out of Standard this fall, but I wouldn’t hold your breath on a major price drop for this version. That’s it for this edition of Tipping Point. Expect me to check in with new editions once a month to keep you guys on the cutting edge. Take care and have fun! Welcome to my first installment in a new series called Tipping Point, which will look to explore important cards that are teetering on the verge of major price spikes due to low supply. My focus here will be to try and flag cards in time for you to grab what you need for decks or get in early enough to profit. In comparison to picks made earlier in the reprint cycle, the cards found in this series are going to a) offer less meat on the bone but b) be more likely to succeed (due to their already low supply/reprint risk). You will also notice that many of these picks will tend to be foils rather than non-foils as for obvious reasons foils tend to dry up much faster than non-foils, except for the most important of staples, where regular copies may quickly follow during a spike in demand. In terms of timeline, I’ll be aiming to get you in and out of positions within a year, or setting you up to save good money on cards you might have been holding back on unnecessarily. It’s been a very busy month in #mtgfinance, with the reveals of the Magic 25 card list, the Challenger decks and the bulk of the Dominaria set being leaked. WoTC’s reprint policy release pace on key cards in Modern and EDH seems to be slowing a bit, rather than gain momentum. This is in part due to their decision to shift focus on Masters sets to loose themes that let them stay flexible. Based on what we know so far about additional sets this year, there are very few risks in investing in or acquiring play sets of cards that have little to no chance of reprint before Core 2019, which releases July 13/18. The next big reprint risk would be a potential Masters set in the late fall. The leaked release notes for Dominaria do not seem to indicate that we are getting fresh Masterpieces, which could further protect some key potential reprints, especially foils. Of course, I wouldn’t totally discount the potential for some twist on special cards to appear in the set, but even if it happens, I suspect we’d be dealing with Legendary cards specifically given the theme of the set. Modern, operating under the halo of Bloodbraid Elf and Jace, the Mind Sculptor being successfully unbanned, continues to look healthy and related cards are selling well accordingly. Many important Modern (and EDH) cards seem to have dodged a reprint for the first half of 2018, setting them up for imminent gains. 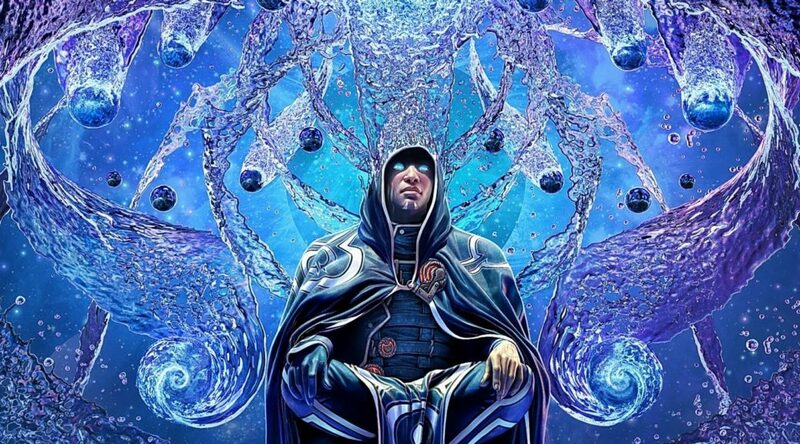 Our best bets here are likely to be cards that are seeing heavy use across multiple archetypes that are unlikely to be knocked out of the winners circle by meta shifts. We first flagged this card in the spring of 2017, with an entry point in the $8-10 range. Traverse has already proven itself in Modern as a cheap and efficient tutor that is almost always a 4-of in the Traverse Death’s Shadow decks. It’s not clear what position that build will occupy as the meta continues to evolve, but with very few foils still lying around, 4000 decks registering the card on EDHREC.com, and relatively little chance of a reprint in the next year to eighteen months, you probably don’t want to sleep on this card if you’re in need. From a speculation perspective this was clearly better at $10, but given that the card is almost always played as a four-of, you could still make $25-30 on a playset if things keep going the way they’re headed. This card has a similar profile to Traverse: first called at $10 last spring, sitting at $15 already, and facing a steep price ramp with every copy that gets purchased on the major platforms. As arguably the most important blue card in EDH/Commander, Cyclonic Rift’s reprint in Modern Masters 2017 opened the door to acquire cheap copies but now we’re not far from hitting $20+ and the next reprint may be a non-foil in Commander 2018 or ’19. Get ’em while you can. Given that this card is less than a year old, the relative scarcity of foils under $20 is telling. Not only are players experimenting with this card in various control builds for Modern, but the ability to play it alongside Gideon Jura and Gideon, Ally of Zendikar due to the new planeswalker rules has really opened up the utility of popular planeswalker characters in general. I was picking these up under $15 last September, but as a foil mythic I could easily see these ending up in the $30-40 range given enough time. There is also a SDCC 2017 promo foil of this card available in the $35 range, so feel free to check that out instead. Generally speaking, buying in on $80 mythics that have already appreciated in recent months isn’t where you want to be. If you see this late and it’s already at $90, even less so. But as a player, if you need this card, what are you waiting for? They just printed this last year, so it’s likely safe at least until November, and probably beyond that. As a speculator, I went ahead and bought copies near $70 recently. Why? Well, for one, though it was originally printed as a rare, that was almost a decade ago now and the reprinting at mythic was almost certainly a mistake given how many tribal decks are running this thing in Modern, EDH and casual circles. The Eldrazi, Humans and Merfolk demand alone would be enough to keep this rolling, but Elves, Goblins, Slivers and Spirits may also prop it up. At this point $100 seems very likely this year, and $120 may be possible. If that’s the case, you’ll want to acquire sooner than later to play with, and then consider selling into the peak when it comes. Every once and a while I check in on the Expeditions to see if any of them look ready to finally make a move. Recenty Hallowed Fountain caught my eye, but Strip Mine makes more sense. As the most efficient land destruction of all time, Strip Mine is clearly a staple playable in whatever format allows it. At present that means it only sees play in competitive MTG through the occasional vintage gathering. On the other hand, there are over 28,000 (!) decks using the card on EDHREC.com, which qualifies this as one of the most important lands in the format. This was also an Oath of the Gatewatch expedition rather than a BFZ release, so there are significantly less around. Cavern is already rather low on most major platforms, and I think these will clear $100 easily within the year. As a Commander player you certainly have use for this bad boy, and if you choose to exit and downgrade later to reap some profit, all the better.